Gentlemen’s farms have long inspired visions of leisure and Southern elegance in Virginia—for four centuries, in fact. Set in the countryside, these estates sprawl across hundreds of acres, more peaceful vacation residences (where one can relax, study, or bask in the land’s beauty) than operating farms. The main houses aren’t quaint country cottages either—rather, they are stately, handsome buildings, blending classical European architectural styles with that of the American South. A selection of the most regal of these homes is laid out in the new book The Gentleman’s Farm: Elegant Country House Living (Rizzoli, $55) by Laurie Ossman and Debra A.
McClane. 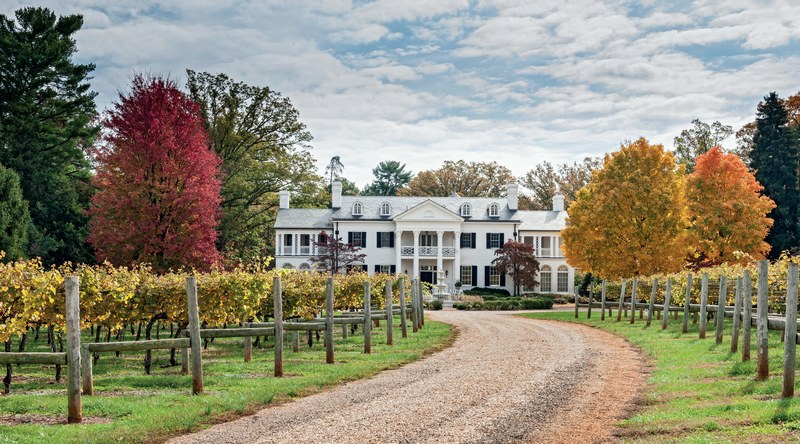 Many have been passed down through several generations, including Thomas Jefferson’s Monticello and James Monroe’s Oak Hill, which are still among the impressive properties that exist in the countryside today. Here, a peek inside a few of our favorites.